Beautifully engraved certificate from the Elizabeth, Plainfield and Central Jersey Railway Company printed around 1900. 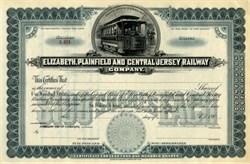 This historic document was printed by American Bank Note Company and has an ornate border around it with a vignette of an electric trolley with a motorman. This item is over 105 years old and only a few are known to exist. The Jersey City, Hoboken and Paterson St. Ry. Co. was a consolidation in November, 1899, of the following: Jersey City, Hoboken and Rutherford Electric Ky. Co., North Hudson County Ky. Co. (controlling the Hudson and Bergen Traction Co. and the Pavonia Horse RR. Co.). Palisades RR. Co.. Paterson Central Electric Ky. 0o., Paterson Horse RR. Co.. The Paterson, Passaic and Rutherford Electric By. Co., Paterson Ky. Co., Saddle River Traction Co., White Line Traction Co.. formerly the New Jersey Electric Ky. Co. The United Street Ky. Co. of Central Jersey Was a consolidation in July. 1907. of the Elizabeth, Plainfield and Central Jersey Ry. Co. (which was chartered in 1900 as a consolidation of the Plainfield Street Ky. Co. end other companies), and the Elizabeth and Raritan River St. Ry. Co. (which was a consolidation on April 30, 1904, of the Middlesex and Somerset Traction Co. and the East Jersey Street By. Co., which latter company had previously absorbed the Raritan Traction Co., the Perth Amboy RR. Co. and the East Jersey Traction company.